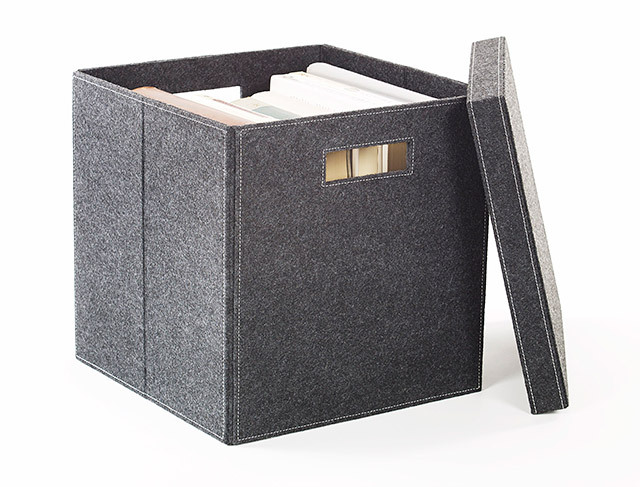 A felt storage box from Organized Interiors looks stylish and is a simple solution for reducing the clutter in a room. These attractive, cube containers come with a hard lid and are perfect for storing seasonal clothing, toys, magazines and various household items. When the box isn’t being used you can fold it up and store it in the lid. Genius! Watch as interior designer and television host Jane Lockhart demonstrates some of the unique features of this storage box. If you struggle with clutter in your home, these attractive storage boxes are the perfect solution for keeping a room tidy. The neutral gray color won’t clash with the decor of a room allowing you to use these storage boxes anywhere. Visit our showroom and pick some up today. If you need more than storage boxes to get your home organized then talk to one of our design consultants or book an in-home design consultation.